After 3 days high to low and oversold conditions, the indexes consolidated back to the hourly EMA. A breakout coil has formed going into FOMC. Though the SPs had an upside breakout from a small intraday base in the globex session, perhaps in part technically triggered, there is still overhead resistance at first the 120 minute EMA and then the overhead levels drawn on the chart below. There tends to be an upside bias the day before the FOMC, but impossible to predict how the market will react the day of the FOMC. Keep an open mind, the previous overhead range provides good resistance to short against, but the Russel is not far from closing back into it prior trading range (11385). Yields: at the lower end of their daily range. Support in pocket on chart below. If ten years take out their 2 day olw daily sell divergences can trigger. EC – wild card – everyone is watching the same swing highs and lows. CD – 2 period ROC Buy Divergences- potential for close back above the 5 SMA. 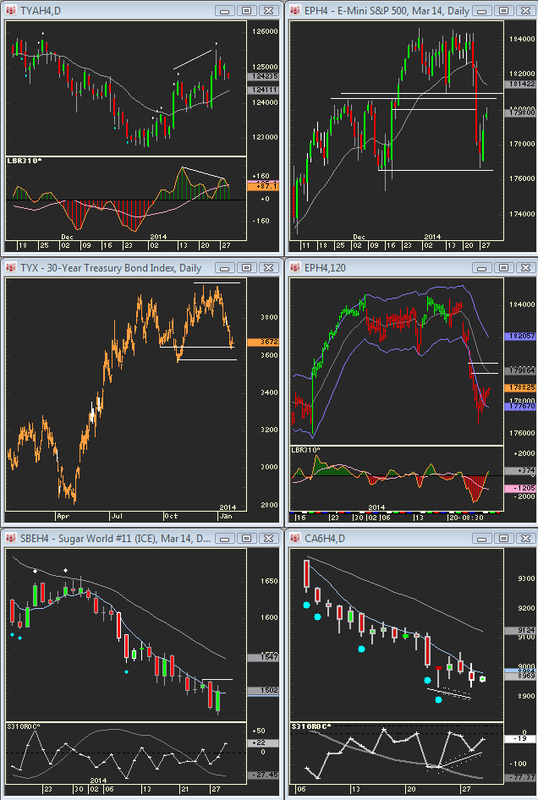 AD – working back towards its daily EMA after 3/10 osc divergences. GC/SI both in breakout mode. Wheat – 3/10 buy div can lead to trade back to daily EMA….SB – Trade above two day high triggers wide range reversal buy. Looking forward to a lift in the temperatures,,,lower high on 120 minute nat gas forming?